now coming to Los Angeles: August 10, 2018. 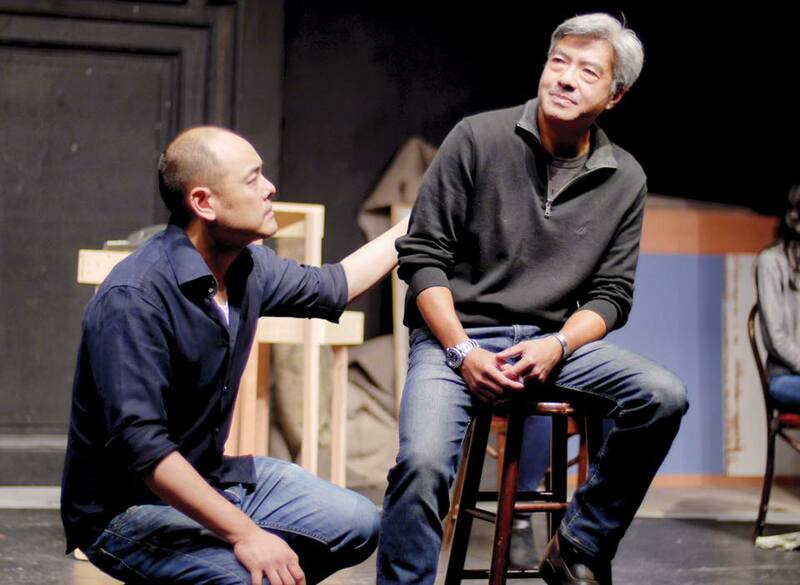 David Henry Hwang's searing comedy! 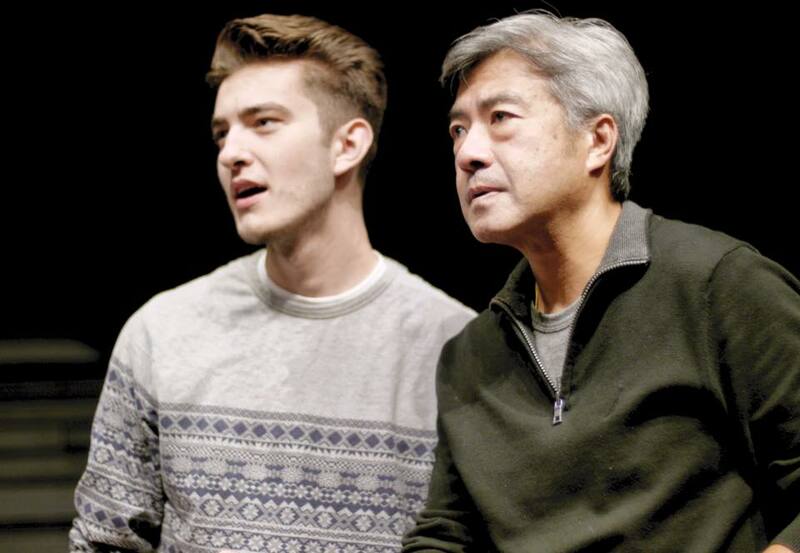 Truth and fiction blur in Pulitzer Prize finalist David Henry Hwang's hilarious and moving show Yellow Face, which is based on the author's own life. When Hwang mistakenly makes a disastrous casting decision, he quickly gets in over his head. As the situation spirals further out of control, he finds himself at the center of a government intrigue and investigation. 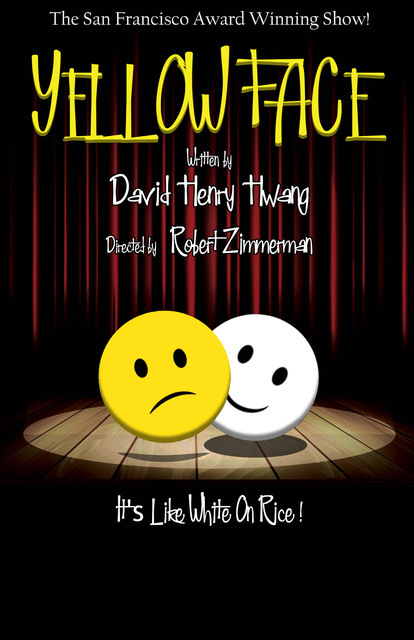 Winner of an Obie award, Yellow Face explores timeless questions surrounding cultural identity through a sharply satirical lens. Director Rob Zimmerman stages this sharply biting look at race, politics and the media at the Beverly Hills Playhouse. 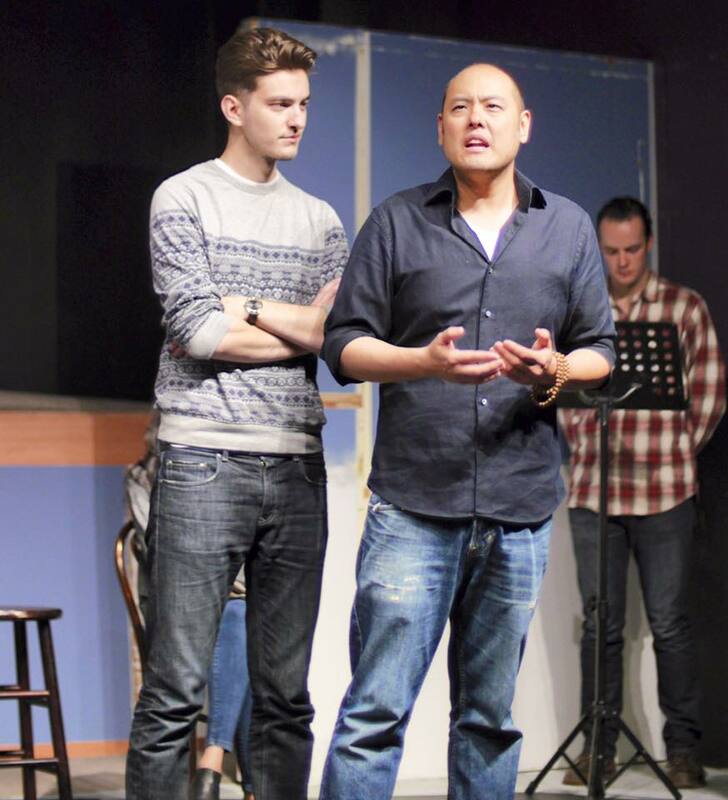 JEFFREY SUN (DHH): Jeffrey is grateful to be reprising his role as DHH! He made his stage debut in the San Francisco production of Allen Barton’s Engagement (Dennis) in 2014. In 2015, he performed in Jordan Harrison’s Maple & Vine (Ryu) and David Henry Hwang’s Chinglish (Minister Cai), where he received a nomination from Theatre Bay Area for best supporting actor. 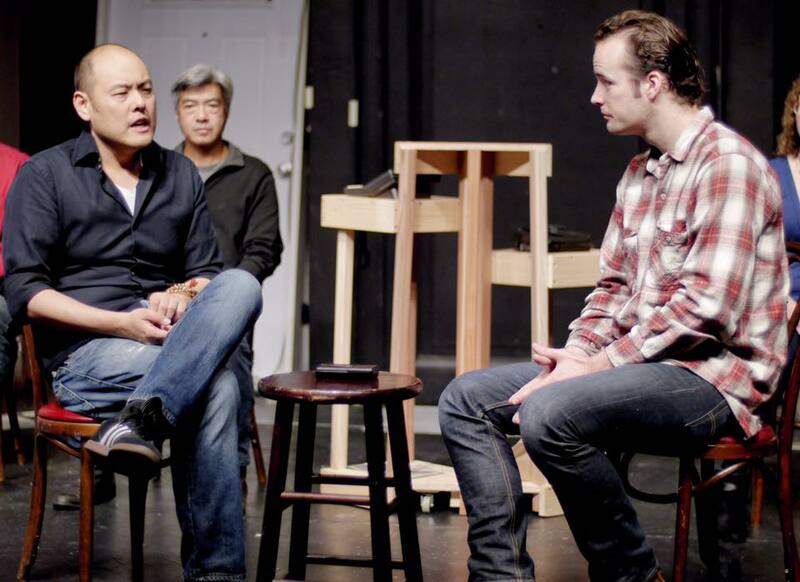 In 2016, he had the wonderful opportunity to direct and perform in the SF production of Yellow Face where it was nominated in the SF Bay Area Theatre Critics Circle. He now lives in Los Angeles. ROMAN MORETTI (Marcus): Roman was born in New York, reared in Silicon Valley, and is now pursuing his acting career full time in Los Angeles. Being raised in the Bay Area gave him access to a wide array of training and performance opportunities, which he took full advantage of from a young age - training at schools such as The American Conservatory Theater, Aberdeen Performing Arts in Scotland, and The Beverly Hills playhouse in San Francisco. This led him to lead roles in Time On Fire, the world premiere of [untitled] Reality Project, and his first appearance as Marcus Gee in Yellow Face at the Firescape Theater in 2016. Always seeking a challenge, Roman is thrilled to revisit his award winning performance as Marcus for his performance debut in Los Angeles. ALFONSO FAUSTINO (HYH & others): Alfonso Faustino worked for several well-known Fortune 500 high-tech companies in Corporate America. He managed legal operations, budget, and management employees on a global scale. As a child, Alfonso found his passion in the film industry; he retired out of Corporate America to pursue his passion in acting, producing, and investing in films and theatrical stage productions, such as, but not limited to, Beginner’s Guide To Snuff (film), Brilliant Lies (play), The Pilgrimage (film), and The Kings (television pilot). Presently, Alfonso is working on a film project at Warner Brothers, as part of their executive production team. When Alfonso isn't performing or producing, he is a student at the Beverly Hills Playhouse/SF improving upon his skills as an actor. JENNIFER VO LE (Leah & others): Jennifer is a fearless multi-faceted artist who seeks to produce work that resonates with everyone on a universal scale. Her willingness to be vulnerable on the stage and the screen is what keeps audience members captivated by her performances. Like a chameleon blending in with its surroundings, she has an ability to dramatically transform her appearance. A UC Santa Cruz graduate with a B.A. in Theatre Arts, she continued her acting training at the Beverly Hills Playhouse San Francisco (2009-2016). Aside from acting, she is also a writer and spoken word poet, often credited as Jennii Le. LISAGAYE TOMLINSON (Jane Krakowski & others): Lisagaye is a Jamaican-born actress, writer, composer, and producer who emigrated to the United States in her youth. She began her career on stage in South Florida playing the role of Dionne in a Caldwell Theatre production of Hair and went on to play Erzulie in Once on This Island as well as multiple roles in a Hollywood Fringe Fest production of Fifty Shades of Shrew. In 2017, she attended the film festival in Cannes where she was featured in a short selected to screen there. Music has always played an integral role in her life and she is deeply inspired by her mother who sang every day in their family home. Lisagaye is known for her appearances on Jane the Virgin, Days of Our Lives, CSI:Cyber, and Scorpion. She is an avid volunteer for the blind, rescued farm animals, and the homeless population. DENNIS NOLLETTE (Cameron MacIntosh & others): Dennis last appeared at the Beverly Hills Playhouse as Michel in “Disconnection.” Co-founder of the Georgetown Gilbert & Sullivan Society, two of his favorite roles at GGSS were Major-General Stanley in Pirates of Penzance and Lord Chancellor in Iolanthe. Film credits include Think Like A Man and Nobody’s Child (also writer/director). Currently producing and starring in the web series, Zach & Dennis: How It All Began which are available on YouTube and Amazon Prime. Dennis has also acted as a producer on shows such as Pinafore!, Buddies, Altar Boys and Galveston (all at the Celebration Theatre). A former studio lawyer and long-time student at the Playhouse, Dennis is a member of Actors Equity and SAG-AFTRA. DennisNollette.com. JOHN PENDERGAST (Announcer/NWOAOC): John is delighted to make his second stage appearance, the first being the initial run of Yellow Face in San Francisco. He has also appeared on the Hulu series, Chance. A Long Beach native, John is happy to be back in the Los Angeles area, studying at the Beverly Hills Playhouse. Outside of acting, he enjoys riding his motorcycle, and practicing martial arts. Long before creating San Francisco’s premiere acting school, Beverly Hills Playhouse/SF, and the award winning Firescape Theatre, Rob started working professionally at age eleven at The Sharon Playhouse in Connecticut. Since then, he has been lucky enough to work/train with some of the top directors in the business including Jack O'Brien, Des McAnuff, Tony Richardson, David Lynch and Milton Katselas. It is from these directors Rob learned the need for storytellers to always be 'pushing the envelope' whether the story is being told for the first or the thousandth time. He tries to bring this sensibility to every BHP/Firescape production. As an actor Rob has appeared in Twin Peaks, Port Charles and starred in the BBC made for TV movie, Murder, Too. Film credits include Don's Plum with Leonardo DiCaprio & Tobey Maguire and Working Trash with Ben Stiller & George Carlin. Be the first to know about upcoming shows, special discounts and events. © 2018 Firescape Theatre. All rights reserved.